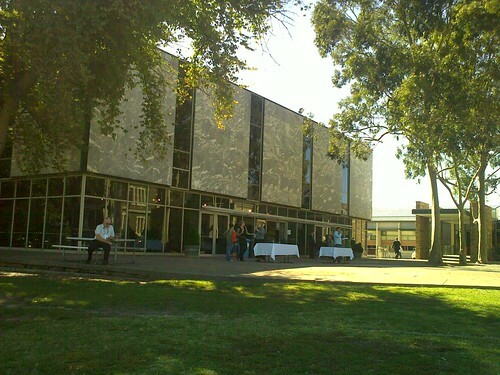 The blog posts below dated April 20 are my responses to some of the sessions I attended at the Association of Australasian International Baccalaureate Schools Conference, held at Prince Alfred College, Adelaide, South Australia over April 17 to 19th. For a while now I’ve found that making notes in sessions as a kind of draft blog post helps me to really focus on MY reactions and responses to what’s being proposed, and helps me focus on what I want to take away from each session. Sometimes I’ve actually blogged these live, but this time round I was using OneNote to record my notes, with another page open for key points to take to key people back at school. I’ve made blog posts on five sessions I saw, which others might find interesting. 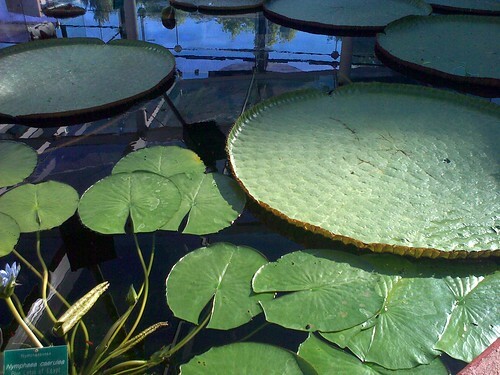 The other thing that was interesting was the giant water-lilies in the Adelaide Botanic Gardens. I didnt have my fancy camera so had to make do with the Nokia E71 but you get the point. They’re beautiful! Ingenious. This was a keynote given to the AAIBS Conference in Adelaide by Marty Gauvin. Marty is a technology entrepreneur who focused on innovation. He began by talking about his own school experiences at St Peters College in Adelaide. He was asked to advice the Curriculum Committee at the school when was still at school, which said something about the school and him. I don’t think he made enough of the kind of opportunity that was for him, though he did call it one of those decisive moments of his life. He described his own journey, led by the phrase ‘Carpe Diem’, in building up Hostworks, an innovative Australian company, which he sold in 2008. This has implications for how we innovate in schools; particularly when we think that lower levels of innovation come with higher levels of ‘comfort’. He also talked about the ‘risk gap’; what you are willing to risk. You need the idea, the team, the time and the resources. Marty’s keynote got a good response and generated plenty of questions, though not the one I would have liked to ask if I wasn’t so far from the roving microphone: ‘is it possible for schools to foster innovation? And how? I came in a little late on this session (blame fine South Australian wine) and Dale Spender was showing a video on 21st Century Learning; ‘I blog but 78% of my teachers don’t, I want to tell stories digitally, my job doesn’t exist yet, that kind of thing. She talked about mobile phones and the need to stop thinking about mobile phones as mobile landlines and think of them as portable computers. She also showed the example of mobile phones emerging in Africa as affordable computers, for moving money around. The woman in front of me had her arms folded early, was shaking her head visibly a little later on, sighing audibly and finally turning to her friend in exasperation. Shender concluded about digital storytelling and did give an earnest conclusion about how she still lamented the lack of innovation and leadership in education, that the factory, the office and the mine had been revolutionised but not the school. She argued that teachers had to lead the revolution because the system wouldn’t and that we had a responsibility to negotiate the change. It was the most passionate she got, and the lady stopped shaking her head for a moment. Westwell argued that it was not simply about evidence based practice; it was more about evidence informed practice and pedagogy; otherwise we’d head towards a ‘one size fits all’ policy, which isn’t the direction we want. He begin with the characteristics, skills, capacities at school that are likely to lead to social and economic prosperity in a time of increasing change but also warned of the dangers and challenges of trying to predict the future. Nice point: Your mind is essentially your personalisation of your brain, which he proved by showing us two photos (a house, a boy) which meant not much to him, but a lot to him, because it was his house and his child. Our brains are wired by our experiences and our responses to our thinking, about the connections we’ve made in our brain cells. So, change the environment, change the thinking. So Google changes the thinking eventually, but our systems respond by going back to basics, banning notebooks, increasing end of year written exams etc. He showed us www.coursework.info which had made a business model out of ‘inspiration in a instant’. We’ve gone from question rich, answer poor to question poor, answer rich. Another good point: ‘socialisation, rather than information, has become the primary use of the internet’; young people have become very good at discerning from authentic to synthetic material, arguing that was why many young people had moved from mySPACE when it was bought by News Limited, and those people had twice forced Facebook to back-flip on changes it wanted to make. It’s not the technology that changes the way you think; it’s about you and what you do with it. Positive users of technology used technology to reinforce existing positive relationships; very few, very strong. Students who fell into the withdraw and isolated category tended to be users with low levels of social engagement and interaction, finding it just as difficult in the online world as the ‘real world’. However, technology does give young people access to extremes of behaviour. He talked about the 1986 split into IB and IGSCE? and the history of the IB and how the various sections had developed individually and how the different programs talked about inspiration and ingenuity. He acknowledged that the IB currently didn’t have an over-arching focus on ingenuity, but that was a goal they were working towards as a direct result of this conference. It was a fairly tenuous link he made at times. It was also blue dotpoints on the official IB template. Hmm. How easy will it be for students to be individuals and have time for personal reflection with a desire for developing self-reflection skills when students are ‘never alone because they’re on Twitter and Facebook’ Students are wanting to present their learning on Facebook, on blogs, on wikis. What is the IB going to do about that? How relevant is the written exam now? Should IB do more about sustainability? How should IB respond to technology overall? He talked about their work with Harvard Graduate School of Education (USA) and publications coming from that association. One of the emphases here was on rigorous learning in the discipline and interdisciplinary synergy as well as focus on real world projects and issues. One interesting point he made was that the MYP program provided opportunities for creativity and innovation in a way that many state-sponsored curricula didn’t. Teachers are ‘given the freedom to create their own courses. 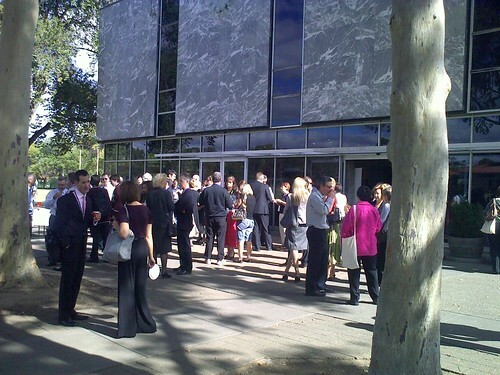 I’m in Adelaide this weekend at the AAIBS (IB) 2009 Conference with the ambitious agenda of ‘Human ingenuity; Pedagogy for the 21st Century. But it’s begun well and I’ll add some more details notes and responses to the sessions when I find a powerpoint and a hotel that doesn’t charge $55 for internet access.